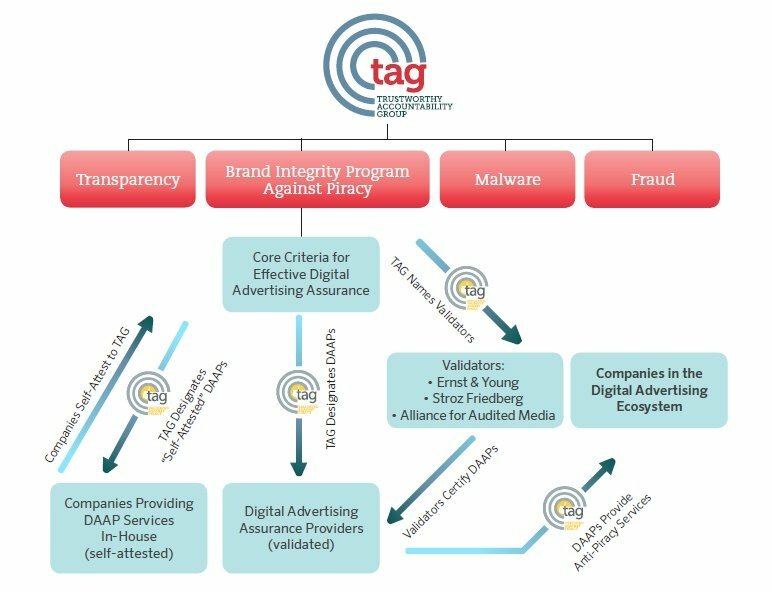 NEW YORK, NY – October 29, 2015 – The Trustworthy Accountability Group (TAG), an advertising industry initiative to fight criminal activity in the digital advertising supply chain, today announced an industry-wide anti-fraud program, Verified by TAG, to fight digital ad fraud and bring new transparency across the digital ad ecosystem. “Verified by TAG” has two core and interlocking elements: the TAG Registry of legitimate advertisers and publishers, which will be available for application today, and a Payment ID system coming soon that will connect all ad inventory to the entities receiving payments for the ads. Legitimate companies across the supply chain can now apply to the TAG Registry to be verified by TAG as a trusted advertising party. Registered (or “TAG’ed”) companies will receive a TAG-issued identifier that they can share with partners and pass with every ad they buy, process, place or run. On a parallel track, TAG is currently developing a Payment ID system in cooperation with leading companies in the programmatic space. The goal of the Payment ID system is to create a record of who gets paid for every impression to prevent criminals from receiving ad spend. Programmatic leaders including AOL, AppNexus, Index Exchange, Google, and Rubicon Project have pledged their support for these dual initiatives, as have the five largest global advertising holding companies, Dentsu Aegis Network, Interpublic, Omnicom, Publicis, and WPP. All of those companies have agreed to encourage their digital partners to take part in both initiatives. Companies across the ad ecosystem are encouraged to apply to the TAG Registry. After a proprietary background check and review process, approved companies will receive a unique identifier that will allow them to identify their ads to trading partners in the supply chain. Those identifiers can also be matched with the upcoming Payment ID system to ensure that payments are going to the correct registered and legitimate companies. Registered companies will also be eligible to participate in TAG’s other seal programs to highlight the steps they have taken against fraud, piracy, and malware. Companies can learn more about TAG’s Anti-Fraud efforts or apply at TAG registration. "For some time, AOL has worked with the IAB and industry partners to combat fraud on two fronts: by deploying the best technologies available and by choking off the economic incentives these bad actors exploit. TAG's registry and payment ID take those efforts even further, putting in place a system to verify digital operators and follow the money trail. The ultimate goal is to ensure greater transparency into the advertising that helps support the free, open Internet, and we are proud to be a charter participant." “Advertising is the power source of a free and open Internet, and it’s incumbent upon industry leaders to keep the marketplace clean and transparent. This important initiative establishes another layer of accountability that will benefit all actors in the ecosystem, and we’re very pleased to be part of it."